The best printable resolution is 300 dots per inch. Extremely low resolution will look “blocky” orÂ pixelated. Imagine only 4 dots per inch: you would see four colored squares instead of a picture. When there are many pixels, your mind blends the tiny blocks together to form an image. At 300 dots per inch, the best resolution for a 4×6 print, then, is 1200 x 1800. 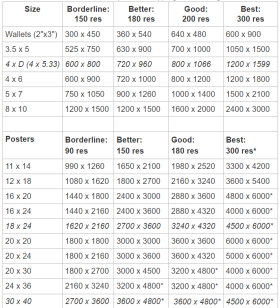 This dotphoto FAQ provides optimal resolution for popular prints and poster sizes.